Hockey is a sport that combines extreme physicality, sheer brute force, and decision-making skills, and when two heated rivals face-off, the game transforms into a heated competition. 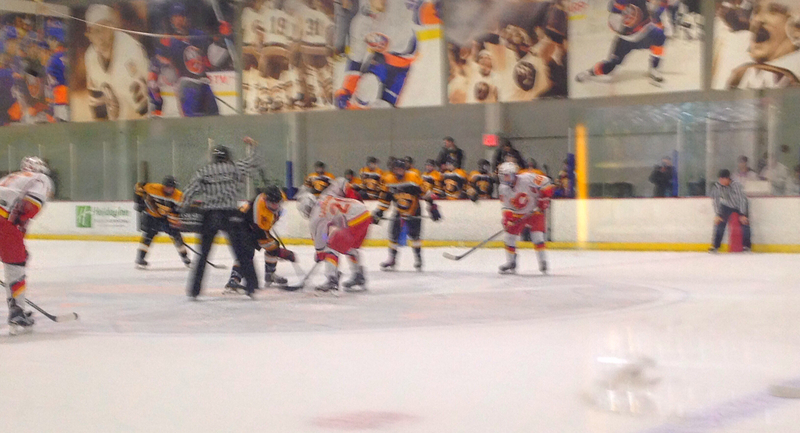 On Tuesday, January 26, Chaminade clashed with archrival St. Anthony’s before a standing-room only crowd at Ice Works Arena in Syosset. In last year’s CHSAA Finals, the Flyers easily defeated their biggest rival; however, this season has been a different story. The Friars defeated the Flyers in their last two matchups and were eyeing a sweep of the season series. The Flyers, looking for some payback for those previous two losses, raced out to an incredible start. The Landolphi brothers led the way for Chaminade. Center Tim Landolphi ’18 won the opening draw, and the Flyers pushed the puck deep into the Friars’ defensive zone. Tim’s brother, Mike Landolphi ’16, circled around from the left wing and found himself all alone on the right wing. Tim shot the puck along the left side and then rifled a cross-ice pass to his brother. The senior ripped a slap shot past the St. Anthony’s goaltender, giving the Flyers a 1-0 lead just 14 seconds into the game. The Flyers would continue their hot start just a few moments later. After a turnover by a St. Anthony’s winger, Mike Landolphi sprinted to the net and tapped home a beautiful centering pass from Tim to make it a two-goal lead for the Flyers. Big hits by Oliver Rapp ’16 and Christopher Riebl ’16, as well as some stingy goaltending by Trent King ’18, kept the Friars in check early on. Tim Landolphi and Zach Morin ’17 consistently succeeded in face-offs, gaining possession to set up the potent Chaminade attack; however, St. Anthony’s cut their deficit in half with about five minutes to go in the first period. A nifty skill move and backhanded pass along the left wing caught King out of position, and the St. Anthony’s center easily found the back of the cage to make it a 2-1 game. The Friars gained a power play just two minutes later, after a slashing penalty was called on Mike Landolphi. St. Anthony’s had an opportunity to pull even, but a wrist shot from the blue line ricocheted down off the crossbar and was cleared away by the Flyers’ defense. Tim Landolphi ’18 takes a faceoff at center ice. At the start of the second period, St. Anthony’s, hungry to even the score, looked like the more energized team. The Friars moved into the Chaminade defensive zone and launched a flurry of shots at King, forcing him to make two incredible pad saves to keep St. Anthony’s off the scoreboard. However, 7:33 into the second period, the Friars offense suddenly struck again. The St. Anthony’s center glided through the neutral zone and maneuvered around both Flyers defenders, cut to his left, and roofed the puck under the bar, evening the score at 2. After letting the two goal lead slip away, the Flyers seemed to lose their composure. Harold Mahony ’16 took a penalty for roughing after the whistle, and the Friars took advantage, turning the power play opportunity into a 3-2 lead. After edging ahead, the Friars never relented. They padded their lead with an insurance goal off another power play, a backhanded shot that whizzed right past the shoulder of King. With thirteen minutes left in the third period, the Friars put the finishing touches on their rivals when a winger found the top shelf with a slap shot from the point. Saint Anthony’s cruised the rest of the way, and when the final horn sounded, they had captured a 5-2 victory, completing a sweep of all three regular season games against the Flyers. The Flyers will look to rebound and regain some momentum heading into the league playoffs. Posted in Sports and tagged hockey. Bookmark the permalink.